guide me in the right direction. 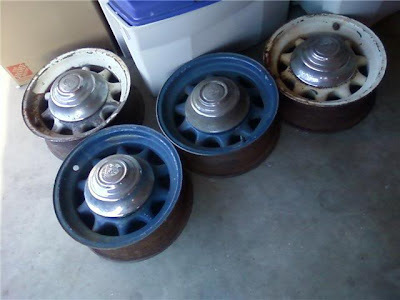 I have what I believe to be a set of Cleveland Welding Wheels aka General Jumbos, two of the wheels have some bad pits on the outer wheel and I would like to restore the wheels so I can run them on my old Chevy. The pits are pretty deep but have not gone through the wheel itself. They are on the inside area of the wheel, possibly the tires held moisture. Stockton Wheel and they say they can change the outer but they want to weld the spoke to the outer. Do you think that's a good idea? The wheels I have are a 15 inch 10 spoke and are a 6 lug, they do fit my Chevy. I would like to restore them like the set you have pictured, chrome inner and black powder coated outer with the caps being chromed also. 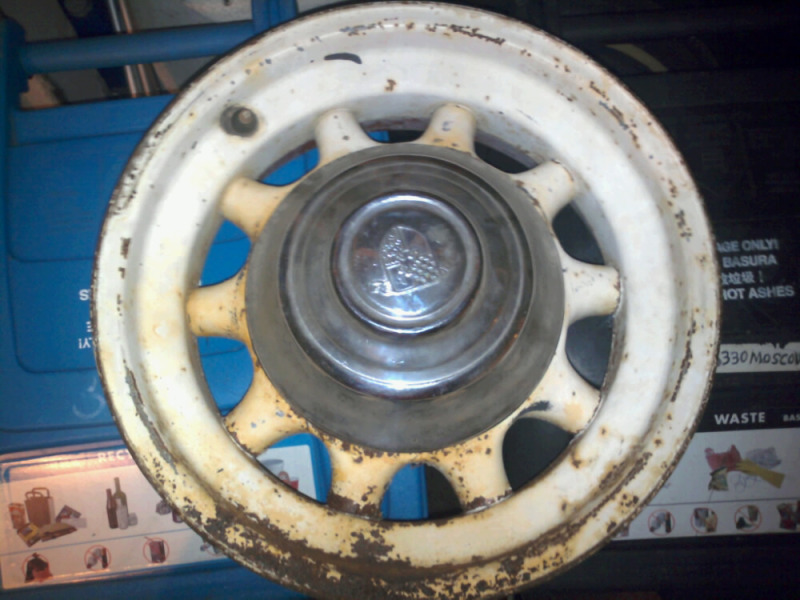 I have included a couple of pictures of the set of wheels I have. Thank you for taking your time to read this and any information would be appreciated. I don't know which blog post you were reading on my web site. If you were reading about the Chevy 9 spoke wheels and saw the picture of the one that looked finished. That was a process called Cosmichrome. The process was a failure. There may be someone in your area that is capable of applying the material properly, but of the 4 wheels that I had done, only one had reasonably good adhesion. The other three pealed when I pulled the masking tape. The absolute accuracy of application is extremely critical, and unfortunately, the guy that did mine, failed to meet that critical accuracy. If you have access to someone capable of applying the Cosmichrome, it would be acceptable to weld the centers to the rims and then do your finishing. If you plan to chrome the centers and paint the rims, I would advise you to put them together with insert nuts in the spokes, as I did with the 11 spoke wheels. Do your fitting with the insert nuts in the spokes, and countersink your fasteners into the rims. That way you can chrome the centers a lot less expensive than doing the whole wheel and then painting the rims after. Either way you go with your restoration project, it will be an expensive and complex process. Reaching your goal will be very rewarding with some very attractive and unique wheels. 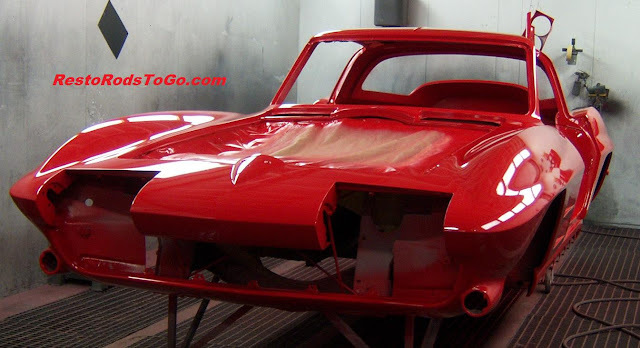 1964 Corvette Coupe Restoration Part 2. Restoration of a 1964 Corvette Stingray requires some different skills from restoration of a metal classic car, or muscle car. 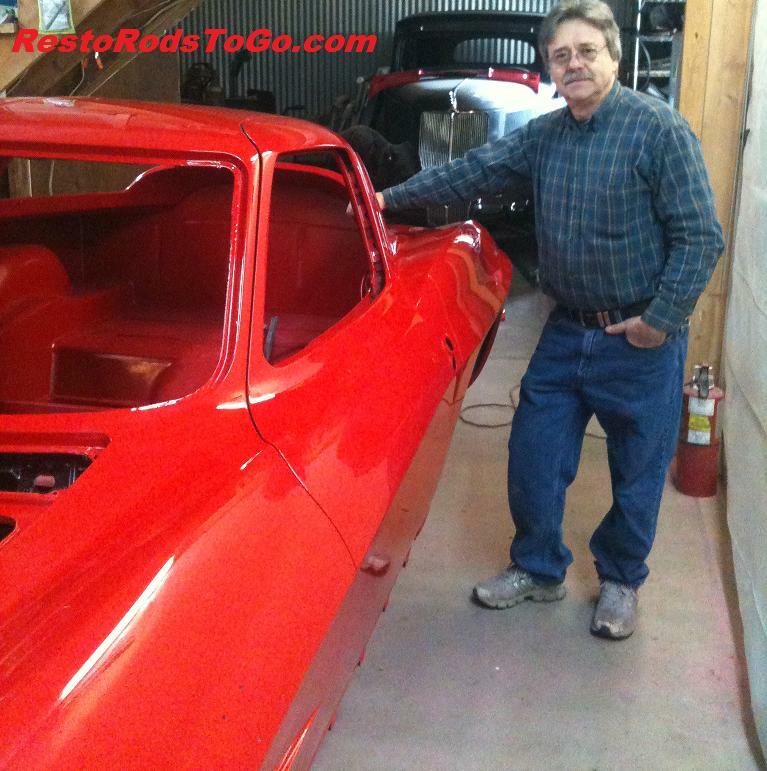 Dealing with rust is a challenge on the Stingray as well, but it is limited to the windshield aperture and chassis etc. The windshield opening structure was rusted and released from the fiberglass, and had to be cleaned, treated and re glued to the fiberglass. This was accomplished fairly easily in comparison to what it might have been, years ago, when we didn't have the modern products. Now we have POR15 to encapsulate the rusty surface and provide a solid substrate to apply urethane body panel adhesive to. These adhesives are used in place of welding at times, on body panel replacements, in the collision repair industry. I actually brought this car to a much higher level of fit and finish than it was from the factory originally. 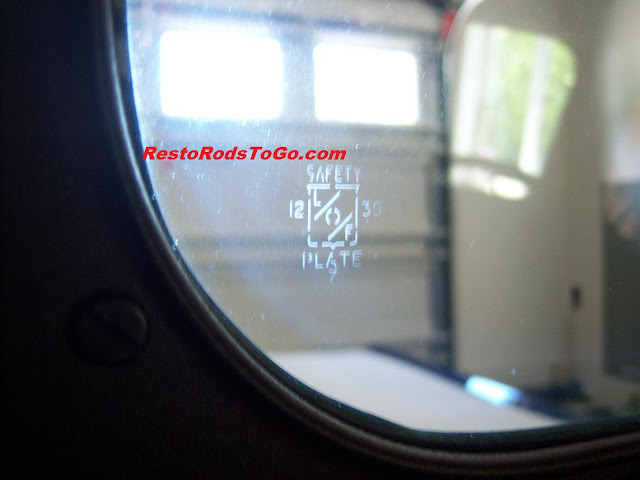 Date Bugs on your glass is an important detail for your restoration project. This is often overlooked or considered not important in a restoration. Some are not even aware that the date bugs exist. Another important aspect in the replacement glass is black edging. This was a process that was almost always used on the 1930's glass. Restorers often only black edge the glass that is visible as in the edges of wind wings, when they were safety glass and the door glass, at the top. This is perfectly acceptable as the edge around the windshield is usually encapsulated in the metal frame. Often too, the edges of the glass are not finished with a uniform radius and polished as they were originally. On a high end restoration, this detail is equally important. 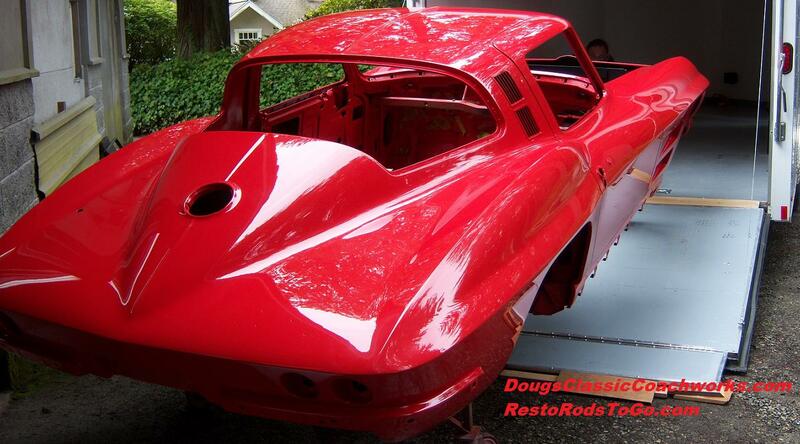 It is the attention to detail that sets one restoration apart from the other. I am personally drawn to the restoration that is done to a high level of detail. I think it is a feeling of high respect and admiration when you run into that project that was done to a level comparable to what you yourself are passionate about. 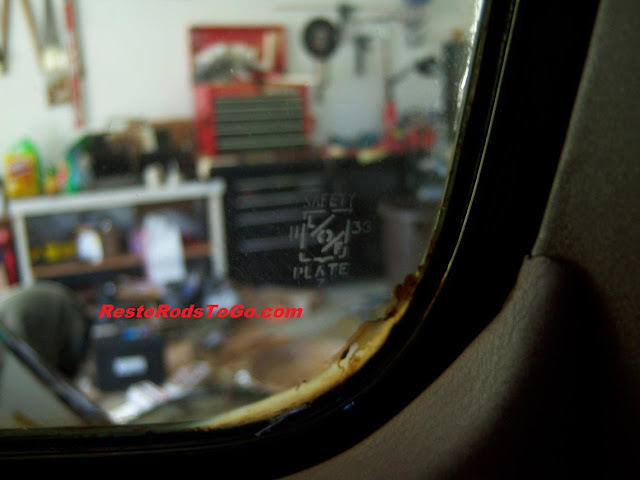 I have a couple pictures of the original windshield and back glass in my 1937 Chevrolet pickup, and some pictures of 1936 Ford date bugs that I will share here. 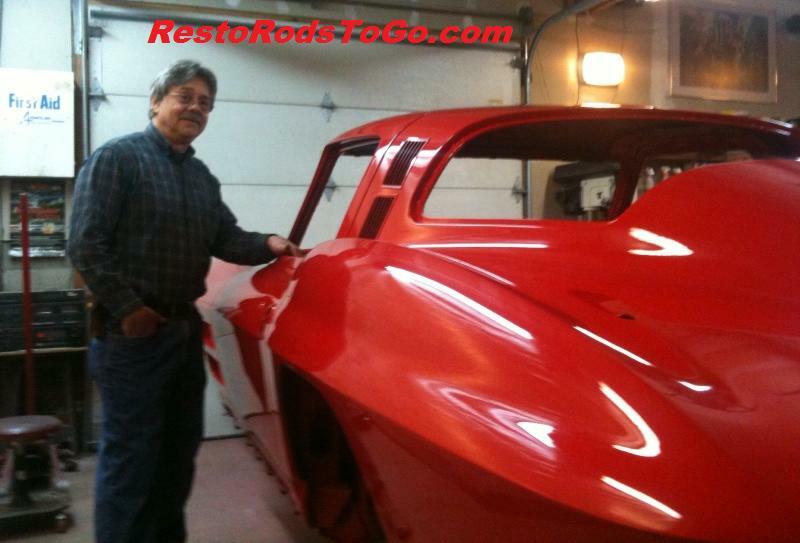 We reproduced the bugs on the 36 Ford Glass with an acid process. Bugs can also be done with a blasted abrasive process. Enclosed drive line installation of the overdrive. 1. Build it so it can be removed from the rear section, in one piece. So the rear drive shaft should be set up with a seal at the flange and yoke/coupler that you can slide the rear shaft of the overdrive into. The coupler should be welded to the rear drive shaft. 2. You will need a breather vent on the top of the unit. 3. I highly recommend running full synthetic gear oil in the unit, as it generates a lot of heat. Standing alone, it has difficulty dissipating it. 4. When you have your speedometer cable made, make sure it is a sealed casing as fluid will run up the cable, some distance from the case. 5. I used a Packard shift control cable, and formed the mounting bracket to fit around my gear shift handle. It slides down on it for a compression fit. I also found a knob that matched pretty closely to my dash knobs. I had to have the shaft turned down to fit the mount/cable jacket, and compressed the end of the shaft to the cable wire again. I think the Packard cable was the longest that I could find. Length is an issue, so make sure you are setting the overdrive at the right distance from your control knob..... making sure you have necessary clearance in the area you are installing it as well.